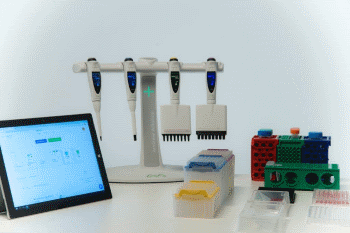 Researchers to benefit from an innovative software-connected pipetting system, bringing improved reproducibility and traceability of experiments to life-science laboratories. GOETTINGEN, Germany / GENEVA, Switzerland, February 08, 2019 / B3C newswire / -- Andrew Alliance S.A. and Sartorius today announced the launch of the Andrew Alliance Pipette+ system, which uniquely provides both full traceability and improved repeatability in manual pipetting for life science laboratories. Andrew Alliance, the robotics company with an innovative approach to liquid handling that is improving repeatability of conventional laboratory pipettes, and the Life Science company Sartorius, are collaborating to bring this intelligent pipetting solution to market. Andrew Alliance is dedicated to advancing science by working with researchers to create a new class of easy-to-use robots and connected devices that take repeatability, performance and efficiency of laboratory experiments to the level required by 21st century biology. Its new class of high-performance, easy-to-use robots, use sustainable technology to dramatically improve the repeatability, performance, and speed of liquid handling. This customer-centric approach, and Andrew, the flagship robot, have won numerous accolades since 2013, transforming bench research in hundreds of pharmaceutical, diagnostic, and academic laboratories worldwide, by eliminating routine pipetting errors and time-consuming manual efforts. Andrew Alliance, a CO2-Neutral Certified Company, is based in Geneva, Boston, and Paris.